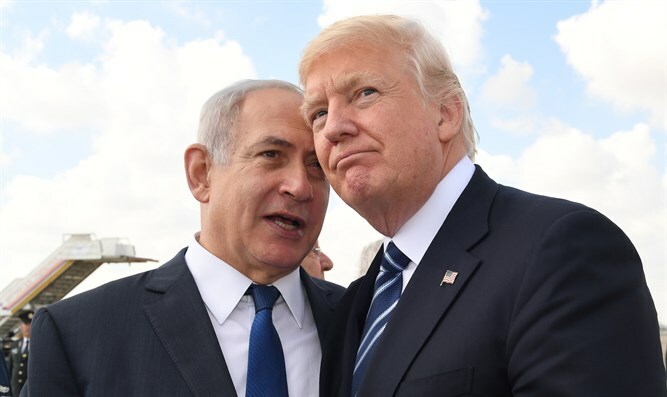 MainAll NewsUS & CanadaTrump: This is a great day for Israel! Trump: This is a great day for Israel! President hails relocation of US embassy to Jerusalem, calling occasion 'a great day for Israel'. President Donald Trump hailed the scheduled opening of the new US embassy in Jerusalem as a “great day for Israel”, just two hours before the unveiling ceremony in the Arnona neighborhood of Jerusalem. “U.S. Embassy opening in Jerusalem will be covered live on @FoxNews & @FoxBusiness. Lead up to 9:00 A.M. (eastern) event has already begun,” Trump tweeted Monday. Two-hundred and fifty administration officials, lawmakers, and other dignitaries from the US came to Jerusalem on Sunday ahead of the opening ceremony for the new embassy, slated to be begin at 4:00 p.m. Monday afternoon. The delegation is headed by Deputy Secretary of State John Sullivan, and included Treasury Secretary Steve Mnuchin; Ambassador David Friedman; Jared Kushner and Ivanka Trump; Florida Governor Rick Scott; former Senator and 2000 Vice Presidential nominee Joe Lieberman; and Senators Mike Lee, Ted Cruz, Dean Heller, and Lindsay Graham. President Trump first announced his plans to move the embassy during his December 6th declaration recognizing Jerusalem as Israel’s capital. During the 2016 presidential campaign, Trump promised to move the embassy from Tel Aviv to Jerusalem, implementing the 1995 Jerusalem Embassy Act. Thousands of Arab rioters gathered along the Israel-Gaza border ahead of the embassy opening Monday, clashing with Israeli security forces. At least 16 rioters were killed and hundreds more wounded in the clashes.